1. Freedom of expression and right to access information of Internet users cannot be obstructed. 2. The BTK (IT and Communications Institute) decision dated 02/22/2011 with number 2011/DK-10/91 lacks legal basis. The unjust decision gives BTK a right which is not prescribed by law. The legal decision also limits basic rights and freedoms protected by the constitution and international treaties directly. While open and unfiltered Internet access is being regarded as a basic human right by international institutions, in Turkey filtered Internet is about to become “the standard”. 3. The comments made by the BTK president claiming the “standard profile” is the current standard and anybody who opts-out will be left out of the filtering system are not correct. Neither there is a notion called “the standard profile” nor an established filter mechanism currently. With the forthcoming mechanism it will not be possible to stay out of the filtering system. If the government officials are really sincere they have to provide an “unfiltered” alternative to Internet users in Turkey. 4. The comments claiming that there will be no surveillance done with the new filtering system are hardly assuring. Clearly it’s not claimed that each and every user will be watched and monitored individually. However since every user will be part of the filtering system, it will open the door to allow the government to track any Internet user at any time at will. As the state does not have the right to monitor it’s citizens’ homes, they should not have the right to watch their Internet either. 5. The BTK filtering system which will take effect on August 22nd, 2011 is unpredictable by the users, arbitrary, and essentially a control and censorship mechanism structurally. The criteria for filtering websites through the different profiles under the BTK system is not disclosed to Internet users. The full authority to build and maintain the filtering lists are handed to BTK by BTK itself. Now BTK will render hundreds of thousands of websites unreachable arbitrarily which is far beyond the current disproportional blocking caused by Law No. 5651. Illegitimate, disproportional and arbitrary administrative operations are unacceptable in a democratic country. 6. Neither The European Union which Turkey is trying to be a member of, nor the Council of Europe which Turkey is currently a member of and none of the OSCE member states embrace any similar mandatory filtering systems. The Committee of Ministers for the Council of Europe strongly emphasized that public authorities must not obstruct access to public information or apply general blocking measures, and explicitly stated that such applications relying on state’s supervision shall be condemned. 7. Similar to previous blocking decisions, state officials are trying to use irrelevant countries as examples to legitimize their unjustified decisions. They are intentionally perversing the description of various state policies in their justifications. It is impossible to accept the state officials’ appeal to negative examples from across the globe to interfere with everybody’s lives in Turkey. 8. Both the European Union, and the Council of Europe of which Turkey is a member state advocates self-control mechanisms instead of legal precautions to protect vulnerable groups such as children. In this context, both organizations emphasize the importance of preventive measures to protect children which do not interfere with adult’s access to legitimate content. For that reason member states must encourage the use of filtering software in houses, school computers and Internet cafes but must avoid employing mandatory nationwide filtering policies. If filter use is found appropriate by families, that should be usedon their own personal computers. 9. Despite the repetitive and pressive requests, TIB’s (Telecommunications Directorate) avoidance from providing the official statistics regarding banned web sites belies the institutio’’s choice of using non-transparent and arbitrary decisions as the main method to outline and develop its policy. The government must implement a new policy to protect the children from harmful Internet content in a participatory way by getting broad public support (NGOs, Academy, and Private Sector). However that reform must not be another initiative to impose the majority’s moral values. In this perspective the statement “We just cannot ignore the complaints from religious people from remote parts of Turkey” stated the by BTK president to justify the new process is unacceptable. The administration does not have the right or the authority to impose conservative values upon whole Turkey. The new policy on Internet regulation must be developed with respect to freedom of speech and adult citizen’s right to consume and access any kind of legal Internet content. The new policy containing these principles should be materialized with a transparent, open and participatory method. 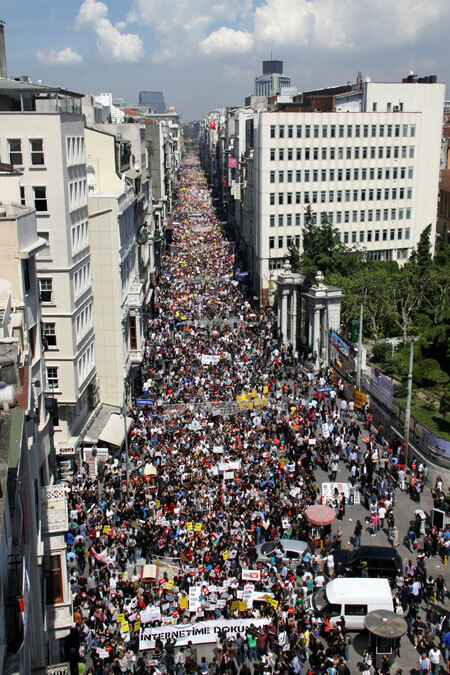 Be the first to comment on "50.000 walked in Istanbul to protest Internet censorship"